Passersby must have noticed the dog that was bumping against the guardrail of a busy highway as she edged along, trying to stay out of harm’s way. Cars continued to speed past; eventually someone stopped to help her and discovered she was hugging the rail because she was blind. 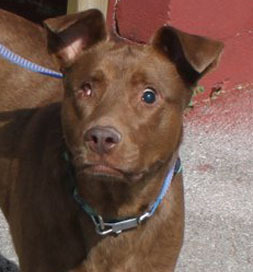 Pet Matchmaker in Treverton, PA, took her in and listed her on Petfinder. This picture on Petfinder changed Ryan’s life. Ryan Desmond’s dad once told him that a house is not a home without a dog. Ryan took it to heart, and when he bought a house, he started looking for a dog to adopt. 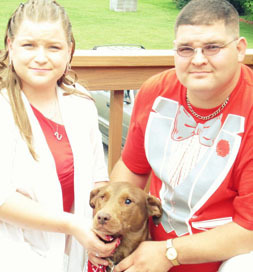 When he saw Mariah, a Pit Bull mix, his search ended. “One look at Mariah’s picture and my mind and heart yelled, ‘Mine! '” he says. “I don’t know why, but if something affects you that much, you don’t ignore it.” He began reading up on what having a blind dog requires. Meanwhile he got in touch with Mariah’s foster home and learned about her issues. In addition to being blind, her tongue was missing a piece, and a gash had ripped through the roof of her mouth to her sinuses and caused repeated infections. Her caregiver brought Mariah for a home visit. Ryan’s house had stairs, but she knew Mariah could handle those. Before the visit was over, Mariah had settled in for a nap. The house passed the inspection, and the adoption was approved. Mariah shared the spotlight at Pam and Ryan’s wedding. These days, Mariah is quite comfortable in her territory and even beyond. She seldom gets out of earshot of Ryan, although she does adventure off to chase dogs in the local dog park. She has a new cat buddy, who has become her “seeing eye cat” when Pam moves furniture around.